President Obama’s 2015 budget proposes $750 million in grants to states to expand prekindergarten programs. Research shows that pre-K can set the foundation for academic success, reaching kids in their critical early years. But children of immigrants, who make up about a quarter of children in the United States, enroll at significantly lower rates, on average, than children with US-born parents. Language barriers, logistical hurdles, and a lack of awareness or comfort with pre-K programs can hold immigrant parents back. 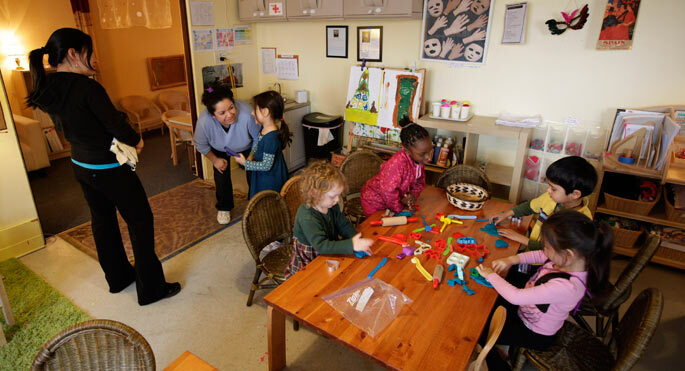 What can pre-K programs do to overcome those barriers and step up enrollment? Getting the word out: Outreach begins by learning more about the immigrant community—who they are, where they are, whether they’re underserved by early education programs, and what barriers may stand in the way of pre-K enrollment. The experts we interviewed also described reaching out to immigrant families by participating in community events, going door to door, encouraging parents of enrolled children to recruit other parents, and advertising in mass media and at the offices of immigrant-serving nonprofits. State directors can support this work with targeted funding or by developing statewide outreach and advertising materials. Making enrollment easier: Immigrant parents may have trouble providing proof of income or children’s birth certificates and Social Security numbers. In those cases where these documents are necessary for enrollment (and often they’re not), some pre-K programs have accepted other sources—such as hospital records or letters from employers—to fulfill requirements. Creating enrollment forms in different languages, providing interpreters or family outreach workers to help with enrollment, and offering a variety of enrollment times and locations can make it easier for immigrant families to sign up. Statewide, standard enrollment forms, translated into common languages, can help facilitate this process. Developing parent relationships and designing welcoming programs: One of the most common ways that parents learn about available pre-K is through word of mouth, as parents spread the news about quality programs. To get there, programs should build strong relationships with immigrant parents by working with trusted immigrant-serving nonprofits and proactively engaging and including parents in school activities. Some states have built requirements for parent engagement into their pre-K models. It’s also important that programs build capacity for communicating with immigrant parents, whether relying on school district translators or volunteer interpreters (but not using children as go-betweens). Finally, some programs have found creative ways to overcome logistical hurdles that may disproportionately affect immigrant parents. For example, some use blended funding to operate extended hours, which can particularly help immigrant parents, given that they are more likely to work nonstandard work schedules. While reaching out to diverse immigrant populations about pre-K, providing enrollment assistance, and building immigrant-friendly programs can be challenging, the people we spoke with made it clear that programs of all sizes and funding levels can work towards increasing immigrant access and participation in prekindergarten. Such efforts are essential to support the academic success of every child.